Free Scheduled Shuttle to Theme parks, International Drive Location, 1 mile to Universal Orlando Parks, Outlet Shopping nearby, Bass Pro Shop 1 mile, Festival Bay 1 mile, Orange County Convention Center 2 miles, I-Ride Trolley every 15-20 minutes takes you anyplace on I-Drive. The Days Inn International Drive is located in beautiful Orlando Florida. This Orlando hotel is in the center of all the Orlando excitement and fun. If you are traveling and need to spend the night in Orlando, you will not want to miss this wonderful location. 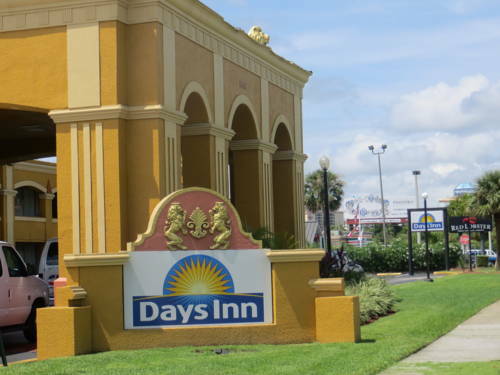 The Days Inn International Drive is located within walking distance of Wet N Wild and in the midst of Orlandos most Exciting attractions, the Days Inn offers many opportunities for fun right here at the hotel. Our Deli-Gift shop offers breakfast foods, snacks, drinks, and souvenirs. Our beautifully landscaped grounds and relaxing pool offer a tranquil respite. Our beautiful renovated facility offers each of our guests a FREE scheduled shuttle to Disney World and Universal Orlando Parks, Access to the famous International Drive Resort area, Free high speed wireless internet access in every room, plenty of shopping within walking distance and many restaurants for your dining pleasure. Ample Parking for all type vehicles - parking fee applies. In-room safe surcharge applies.